The new year began with a bang as Forest Club Eco Resort hoted the sales rally of real estate development company Camella Homes Southern Tagalog last 10 January 2019. More than 200 participants joined the event that also saw them taking on the outdoor challenges available at the Club.To view more photos of the event please visit our Google Photos page. A group from Moreton Hire Pty. Ltd. visited Forest Club Eco Resort last 17 December 2018 for an overnight team building activity. Fifteen employees from the event management company took on the outdoor activities available at the Club.To view more photos of the event please visit our Google Photos page. Tour operator M&C Tour Services brought a group of teachers from Noveleta National High School to Forest Club Eco Resort last 17 December 2018 for a day of outdoor activities.To view more photos of the event please visit our Google Photos page. A group from Universal Robina Corporation visited Forest Club Eco Resort last 14 December 2018 for an overnight team building event organized by Playworks Team Building. Forty-nine employees from one of the country's largest branded cunsumer food and beverage products company joined the event.To view more photos of the activities please visit our Google Photos page. A group from Jentec Engineering Services travelled to Forest Club Eco Resort last 13 December 2018 for an overnight team building event. Thirty-five participants joined the activities designed and facilitated by Playworks Teambuilding.To view more photos of the event please visit our Google Photos page. A group from Workforce PH, a one-stop online portal for outsourced business process services, visited Forest Club Eco Resort last 8 December 2018 for an overnight team building event. Thirty-five participants took on the outdoor challenges prepared for them by the Club marshals.To view more photos of the event please visit our Google Photos page. The Office of the Municipal Agriculturist of Noveleta, Cavite was in Forest Club Eco Resort last 6 December 2018 for an overnight team building event. Nineteen personnel from the local government entity took on the outdoor challenges available at the Club.To view more photos of the event please visit our Google Photos page. A group from the Laguna Accounting Center 3 of Land Bank of the Philippines visited Forest Club Eco Resort last 1 December 2018 for a day of wellness in mond, body and spirit. Fourteen participants took on the team building challenges prepared for them by the Club marshals.To view more photos of the event please visit our Google Photos page. 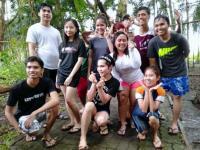 Members of fans club Running Man United assembled in Forest Club Eco Resort last 1 December 2018 for an overnight bonding and team building event. They took on the outdoor challenges available at the Club. The group is composed of fans and supporters of the popular Korean show Running Man. A small group from the Parañaque City Veterinary Services Offices was in Forest Club Eco Resort for a 3-day, 2-night team building activity last 29 November to 1 December 2018. The participats took on the outdoor challenges available at the Club.